Socialist Alexandria Ocasio-Cortez is on a roll making a name and a political force for herself to be the new face of the democrat socialist party. She’s proposed her New Green Deal, which will destroy the US/ global economy, thru eliminating fossil fuels to cows and airplanes, sending us back to the 1800’s (if not the stone-age), and is viciously attacking ICE (Immigration and Customs Enforcement) as an unchecked agency, violating illegal alien’s human rights, supporting a “radical agenda” (aka PROTECTING America)! Take note at no time did she mention the number of Americans who have fallen victim to her precious “immigrants”. Yes America, the agency who protects you against individuals who have NO RIGHT to be in the US does not deserve a dime or any resources to do their job. AOC is fine with MS-13 and other criminals running loose in America, including her own district where an MS-13 gang member, out on bail, gunned a rival gang banger down in broad daylight on a subway platform. This CHILD, and that is what she is, is going to get people killed. She is Tom Hanks’ character from the movie Big, a child pretending to be an adult who is incredibly dangerous. Nothing she says is based in reality, she is driven by feelings, emotions and the objective of turning the US into a socialist, if not communist, nation. 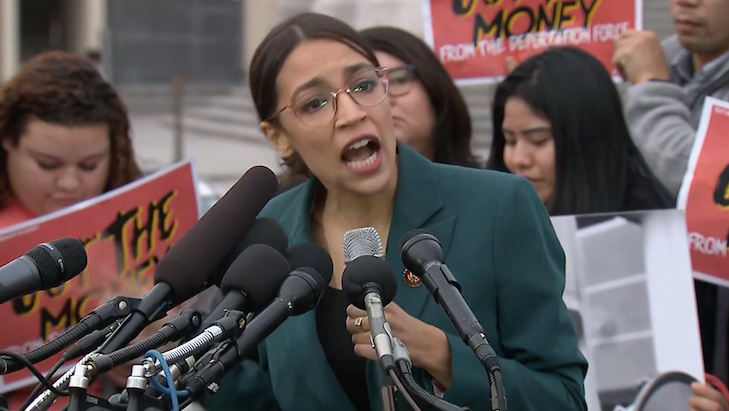 Her New Green Deal is a perfect example of her delusions of grandeur for that utopian society the left seeks regardless of the carnage left in its wake!